Two-year colleges play an important role in preparing the next generation of the geoscience workforce. And there is an array of issues that affect how and how well our institutions are able to do that. 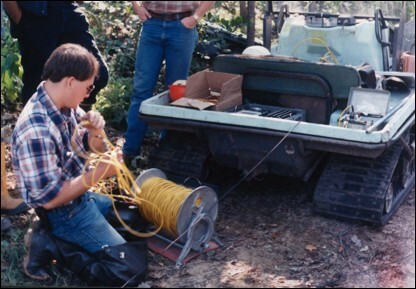 Preparation for a seismic study at well sites, Woburn, MA. Preparing your students for their future careers isn't something you can do once and just check it off. Done well, it's an integral part of their education. Many different aspects of their experience - both inside and beyond the classroom - can contribute to your students' professional preparation. From advising and internships to seminars and innovative curricula, the opportunities to distribute information about geoscience careers and to integrate professional preparation throughout programs are numerous and varied. 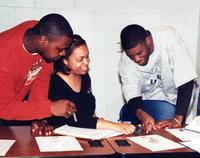 Many programs throughout the country focus specifically on preparing students to enter the geotechnian workforce. These programs commonly focus on local issues and workforce needs, have both college-transfer and technical courses, and lead to AAS degrees or certificates. Some students enter the geoscience workforce with a degree from a 2YC. Others need to transfer on for a four-year degree or more to reach the career they want for themselves. Understanding how to best support students before, during, and after the transfer process is critical to their success. EPCC student Belinda Gonzalez and EPCC professor Joshua Villalobos installing groundwater piezometers for her project on groundwater fluctuations in a mitigated wetland in El Paso TX. Provenance: Created by the author of the page containing this file. Two-year college (2YC) students can be a very different from those enrolled in four-year institutions and conducting research at 2YCs can be difficult for a variety of reasons. Regardless, two-year college students can benefit greatly from the academic and social development that research experiences afford. Preparing Students in Two-year Colleges for Geoscience Degrees and Careers: This workshop brought together faculty, administrators, and representatives of professional societies to address the challenges and share successful programs and activities for bringing students from two-year colleges into geoscience careers. We worked together to develop new strategies and recommendations from the classroom to the national level. Participants became part of a network of colleagues who share similar challenges and concerns for the preparation of 2YC geoscience students. InTeGrate - Geoscience and the 21st Century Workforce: This workshop from the InTeGrate project was held in 2013 as a way of looking broadly at employment opportunities for students from geoscience and related programs and from other programs that include geoscience and considered employment opportunities for students with associate degrees as well as bachelors degrees. The American Geosciences Institute has a website on Geoscience Workforce issues and information, including a number of career-related webinars. The Role of Departments in Preparing Future Geoscience Professionals: This workshop from the Building Strong Geoscience Departments project sought to improve the ability of departments to prepare geoscience students for professional careers including traditional roles in academia, government research, industry, and teaching, as well as opportunities in business, law, public service, and elsewhere. The workshop brought together faculty leaders, chairs, and other campus administrators to discuss strategies that have been effective on their own campuses, to develop new ideas to strengthen their programs, and to develop recommendations regarding the critical elements in preparing future geoscience professionals.